This weekend past, friends had another great Bring and Braai, i.e., a South African-style “pot luck” grilling party. My contribution was two pounds of ~20 ct. large, frozen shrimp, for $13/pound. When grilling shrimp, I’ve learned a great technique: grill the shrimp, whole with tails, legs, and shell intact. They should be unfrozen and will cook in a few minutes and you just need to flip them once. Of course individual shrimp could easily fall through grill grates, so skewer them or use a grilling basked, as shown in my photo above. While I didn’t do it here, it’s best to cut a long slit down the back of each shrimp – this makes them easier to peel after cooking. First and foremost, the shell keeps the moisture in. 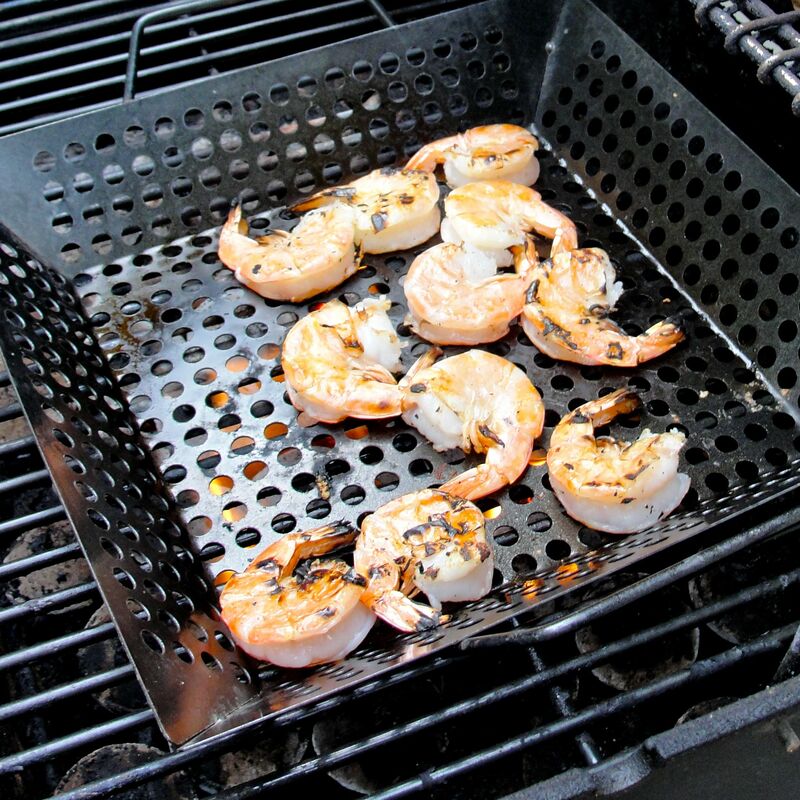 The shell keeps the shrimp from sticking to the grill; no oil is necessary. With the shells intact, shrimp achieve beautiful color. You see the shrimp as it really is. I don’t have much patience for people that don’t want to know what they’re eating. Animals have legs, tails, bones, and heads, and (sometimes) cute faces. If you don’t like being reminded of that, eat tofu and leaves instead. The “work” of peeling the shrimp can be passed on to whomever is lucky enough to eat them. And look at the reward you get for merely peeling one large shrimp. That’s right, they’re not (above); the digestive tract is sometimes intact. As long as shrimp are thoroughly cooked, deveining is really a matter of aesthetics. Of the shrimp I ate, perhaps 8 total leftover, only one definitely needed deveining… which I did before eating it. 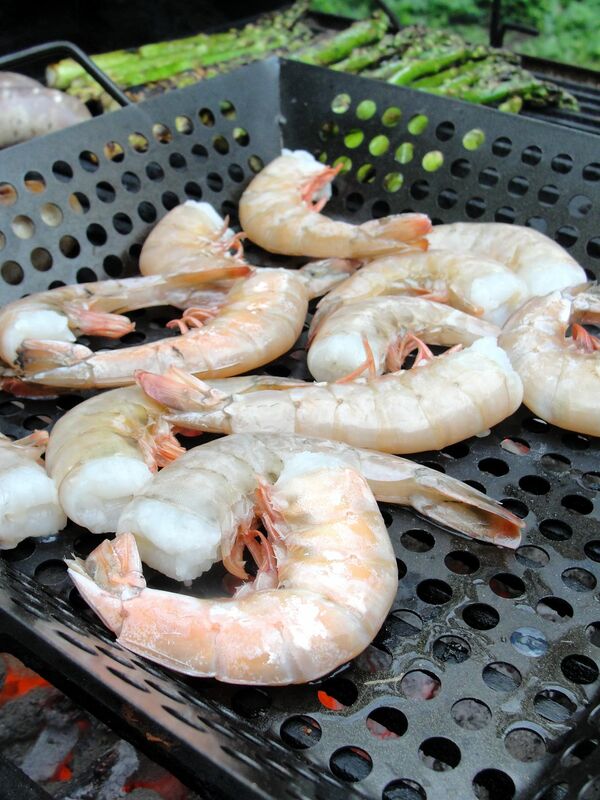 Anyway, if you prefer to devein shrimp, go for it – the grilling method works the same, and it’s easier to remove the shell that is cut down the back. I more often use deveined shrimp anyway as raw shrimp are often sold deveined (in the U.S.). Deveined shrimp do have their own aeasthetic appeal, for instance, as they sometimes splay open in a soup, such as Tom Yum Goong. The coconut-milk based Peanut-Lime Dipping Sauce was probably the more popular, but both are quite good. You’ll see me reuse the latter sauce in my next two posts! I sometimes use the skewers for the shrimp but the basket is far easier. All most all of the frozen shrimp that I buy is already devined with the shell still on. The peanut lime sauce sounds good. Hi Matthew – Thanks. I agree, in general – I only leave the shells on when grilling.